Fiestas partrias mexicanas are one of my very favorite holidays to celebrate with students. Maybe its because I live in Arizona so close to the Mexican border, because I typically have so many students of Mexican descent who are interested in the holiday or celebrate at home, or because of the amazing Mexican friends I have who are just so full of patriotic pride and have taught me how to really celebrate a holiday. Because Mexican Independence falls so early in the school year, I prefer to keep things simple. For my beginning level students, I do a 1 hour lesson, primarily in English, with Authentic Spanish language media that uses simple language structures. 1. Students will be able to describe key events in the Mexican independence movement of the 1800s. 2. Students will be able to describe key parts of the Mexican culture including who the president is, how Independence Day is celebrated, what the zocalo is, and what the cathedral is. 3. Students will be able to listen to a traditional Mariachi song to identify Spanish words they understand in writing and by listening. I use a short quiz to access prior knowledge and engine engagement. We go over the answers immediately after all students finish, as a way to introduce main concepts about the holiday. I show a Youtube clip of about 2 minutes of this year’s “El Grito” taking place in Mexico City. Here’s the 2017 version (I cut straight to the grito itself). Meanwhile, students fill in the notes on their concept maps as we pause and discuss what they saw. Just do a Google video search of "el grito d.f. 2018" to find this year's once it is posted. We talk about Pena Nieto and some of the controversy surrounding him. In early 2015, his wife Angelica Rivera came under scrutiny for a series of real estate holdings in another name that were linked to conflicts of interest on the part of Pena Nieto. He was absolved in August 2015, but this scandal was a blow to his public perception. We also talk about the drug war, cartel violence, and slow economic growth that are currently frustrating many Mexican citizens. Lots of current issues. Once concept maps are complete, students listen to one of my favorite mariachi songs, “Viva México”, through Youtube. They listen through several times to identify simple Spanish words they hear. I do cloze activities throughout the year with my beginning students, and this is the first one, so I keep it simple! With any leftover time students work independently or in small groups to complete a simple reading activity. This is a summative assessment of sorts, wrapping up their understanding of the holiday. I love doing this part last because if we run out of time, it can easily be assigned for homework. I organize my whole lesson using a Powerpoint and a packet of student handouts, just to keep me on track. 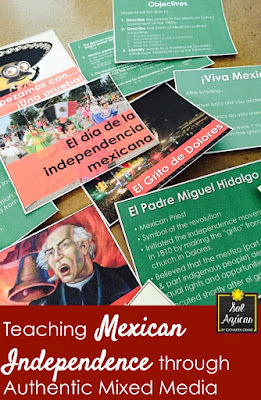 How do you celebrate Mexican Independence day with beginning students?